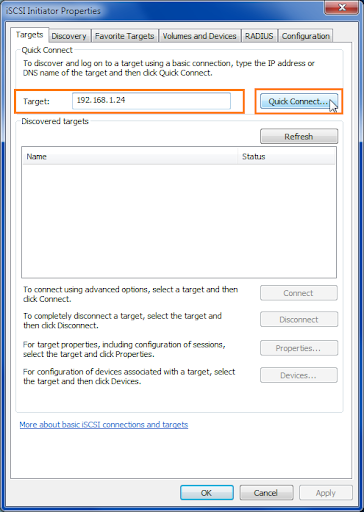 EaseUS Disk Copy Home Edition is a simple cloning utility in the form of a Live CD. Disc Copy performs a sector by sector copy of the source drive and deposits the resulting data in to another drive, Sectory by sector copies are exact copies of the source drive resulting in an exact image. 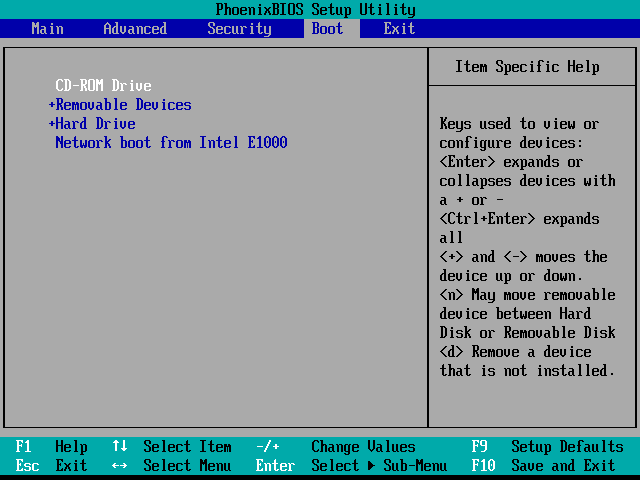 EaseUS Disk Copy interface is simple to understand, actually the user is presented with few options in regards to how the cloning will performed. 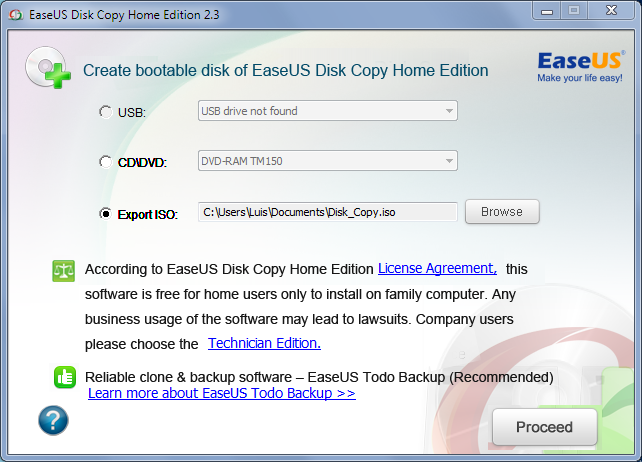 EaseUS Disk Copy Home Edition is freely available to home users, business users need to purchase a license. free version has a 1TB drive limit. 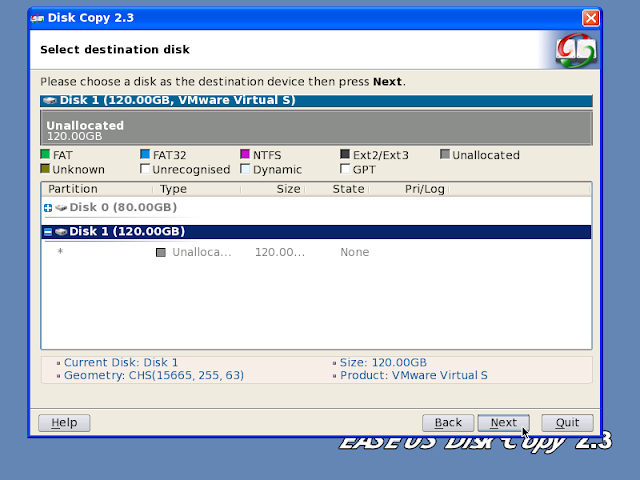 Consider using EaseUS Disk Copy if you need to migrate an operating system from a smaller drive over to a larger one. For this tutorial I will be cloning the contents of a 80GB drive over to a 120GB drive. But before you can use start cloning you need need to download the EaseUS Disk Copy executable which is responsible for creating either a Live CD, .ISO or bootable USB needed to start the application. Run EaseUS_DiskCopy_Home.exe. 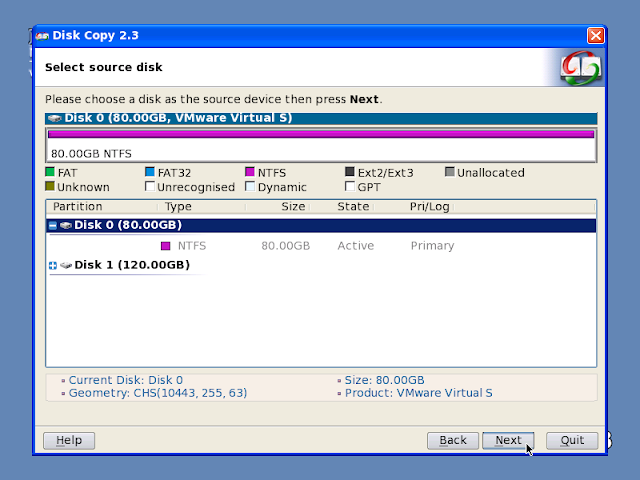 Depending on your preferences you can choose to create either a bootable USB drive, .ISO file, or bootable DVD/DVD. Depending on the system BIOS you need to boot in to either the CD/DVD Drive or Removable Devices which is another name for USB drive. For most cases you should pick Disk Copy. I wish to transfer the content of my 80GB drive over to the new 120GB, which is why I selected the 80GB drive as the source. Click on Next when ready. The 120GB drive will be the destination. Click on Next when ready. Task preview – this is where you review the changes that are about to be made. Click on Proceed when ready. Make sure you are working with the right drives. Click on Yes if you are positive of the changes. Depending on the amount of data being handled the operation might take a while. You can review the results if you like. With the cloning operation successfully completed you can click on Done or Quit to exit. When prompted click on Yes to reboot. Now, make sure you remove the source drive and install the new drive in the same port where the previous was connected to. If you need a some cloning utility then EaseUS Disk Copy Home Edition is the answer, I don’t have much to say other than it works and is free for home users. 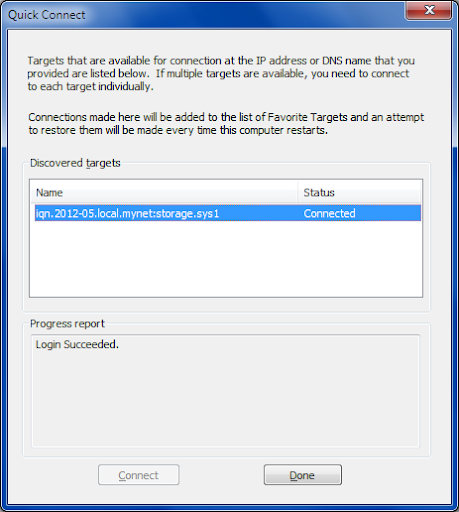 Second – Every step below will be performed with Root privileges or similar. 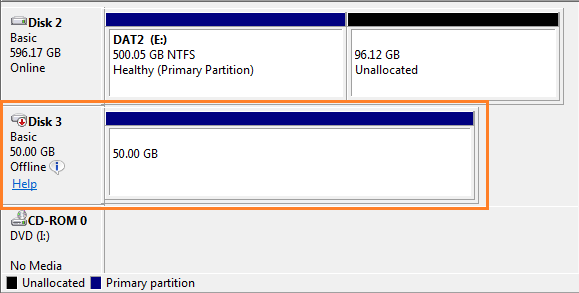 How Many Drives Are Available ? Listed are five drives, /sda /1 /2 contain the Operating System, /sdb and /sdc are empty and will be used to create the RAID1 array, /sdd can be left alone or used as a hot-spare. First of all we should prepared the drives we want to include in the array, by preparing I am referring to partitioning each drive. For the purpose of partitioning we will be using a well known utility called fdisk. Repeat fdisk in every drive that will be part of the array, remember you will need to run the exact command and parameters. I’ll do my best to guide you through the required steps to format a drive with fdisk. If you prefer a graphical interface, GParted is a good alternative to fdisk. Is MDADM Installed In The System? The answer is probably no!, if this is your case then I would recommend installing MDADM via the designated package manager for your Linux distribution. For Red Hat and derivatives you can use yum. Debian and derivatives you can use. If you carefully look at the command below you can see the creation of the array, RAID level selected, and the devices to be included in the array. You’ll be asked Continue creating array?, the answer is Yes. 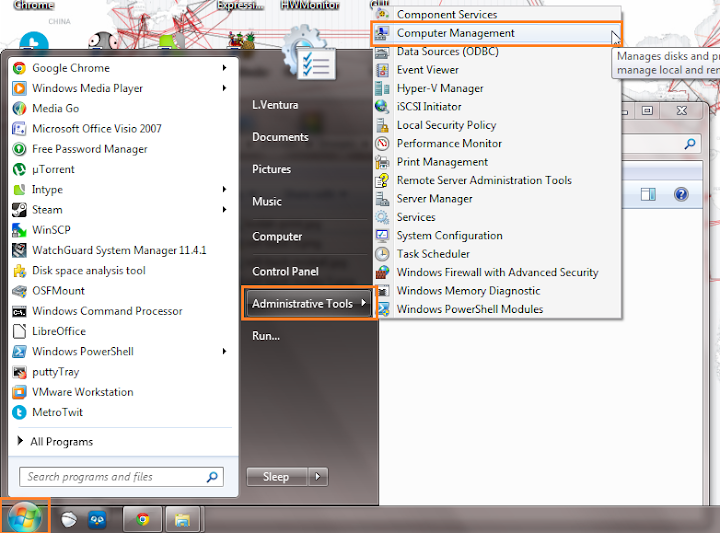 Now we add the new array to the systems mdadm configuration file mdadm.conf. Monitor the creation or rebuilt process of the designated array. You can also monitor all arrays within the system. I consider this to be a more elegant display. Grab a cup of coffee or a beer it might take a while before the operation completes. Now that our array is complete we format the volume. Format like you would format any other drive. If you want to make use of your new array which from now on we’ll call volume we need to mount it first. Create a directory where we can mount it. 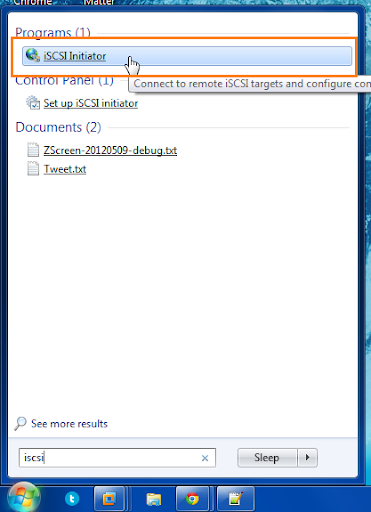 Now provide the path to the array and path to the directory we create in the previous step. 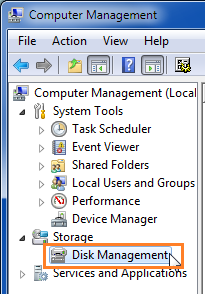 Make sure our user can access the partition, by giving ownership of the partition to our regular user. Otherwise you will have to be root to create anything. user:user will changing according to your system. Thanks to the df command we can see our RAID protected volume, check the bottom of the output. However, if you want the volume to to survive a reboot you need to add the volume to the /etc/fstab configuration file. You can easily add the new array by making use of the echo command. Let’s see if our new entry is in the /etc/fstab file. There it is, now our array should be mount it every time we start the system. If you have questions or suggestion on how this tutorial could be improved leave a comment below, thank you. Just a heads up. I will be changing the domain registrar for Linhost.info from Go Daddy to Namecheap, if you notice any weird behavior then now you know the reason. One thing is clear, I won’t miss Go Daddy’s torturous interface. ExFAT is an abbreviation for Extended File Allocation Table a file system intended for use in flash drives, exFAT main advantage over the more traditional FAT/FAT32 file system is that it can store a file larger than 4GB. With the increase in flash drive capacity FAT/FAT32 can be limiting. While exFAT sounds like the right solution it comes with inherit problems for users of Free Software such as Linux, you see exFAT is a file system created and patented by Microsoft meaning due to patents support for exFAT in Free Software is bound to be flaky. ExFAT adoption is not a problem for the Windows platform: by Windows XP (SP2), Vista, and 7 are already support exFAT. While not the best solution it is possible to mount exFAT formatted drives by using FUSE which is also an abbreviation for File system in Userspace, 🙁 . Before you can make use of Fuse-exFAT you need to first install python-software-properties which includes add-apt-repository. This is required of you wish to continue with this tutorial, this package includes the tool needed to add the repository. Add the new PPA (http://pre.google.com/p/exfat/). Create a directory where we can mount the drive. Mount the drive and specify the file system used by the flash drive. Display the newly mounted exFAT drive. There you have it, it might not be pretty but it works. Device driver or software driver are a must if you want to get the most out of what ever hardware you are using and in my case it happens to be a graphics card but this time updating to the latest driver released by NVIDIA resulted in an annoying problem. Whenever I play Battlefield 2 Bad Company I sometimes get a black screen right when I am about to shoot some punk. 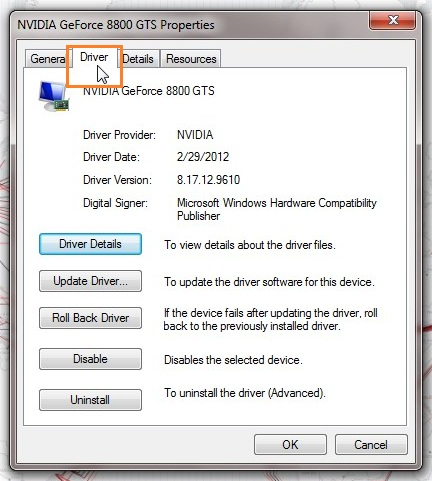 NVIDIA drivers now support Braille ?. In Windows rolling back to a previous driver version is surprisingly easy all you have to use is the Windows Device Manager. 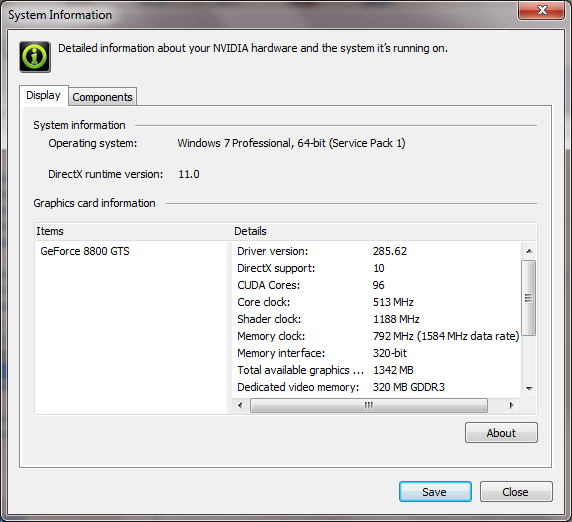 As of this writing the latest driver for my NVIDIA 8800GTS graphics card is 296.10. 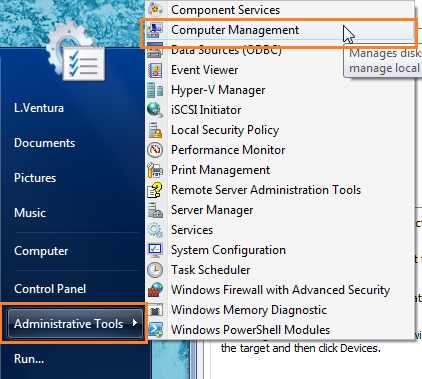 From Windows go to Start > Administrative Tools > Computer Management or go to Run and type compmgmt.msc. 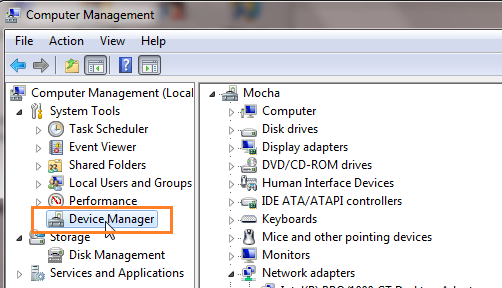 On the left sidebar search for and click on Device Manager. Search for Display Adapters and right click on yours, click on Properties. 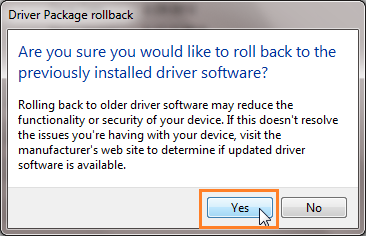 In order to revert back to the old drive you have to click on Yes. Wait for the changes to take effect you might get a temporary black screen. 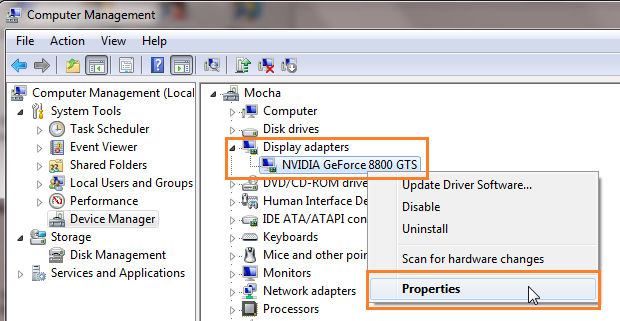 To see if the changes were successful check in the NVIDIA Control Panel. The reason why tools like Shred exist is because we don’t like the tough of our files ending in the hands of the wrong people and if it’s within our reach to prevent such an occurrence then why not take the steps. Shred accomplishes its goal by repeatedly overwriting the target with specific data patterns in order to make recovery of the data contained within the drive impossible. As long as the system can see the drive Shred should have no problem erasing the contents. Keep in mind that erasing a drive will take a considerable amount of time. The simple version of shred would be. This would erase the second partition in /sda using default options. But we are geeks and the defaults just wont do, if you like you can opt to use different parameters as explained below. By default Shred will overwrite the target three times if you think the default is too much or too little you can change the default by adding the -n # parameter to change the overwrite amount. 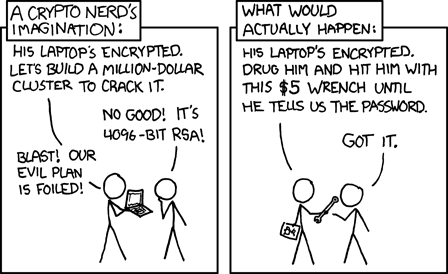 Shred will not save you from the XKCD five dollar wrench recovery method. Previously I wrote about Hashing a directory with md5deep since that post was written I’ve received a few comments asking how to accomplish the same but with an entire drive which is why I’ve decided to write this post. The actual command to hash an entire drive with md5deep is quite easy to understand and execute just like before. Normally if all you want it to do is hash a single directory you would use the exact command below. The command to hash the contents of an entire drive is similar to the one above, but instead of using the directory path we only need to use the drive letter. Once you have the resulting hashes from the operation in a text file you can refer to my second post on how to Compare Hashes With md5deep.